If you are like me, you always need birthday cards! I have started to replenish my stash of birthday cards to use for the rest of the year and here is one of those cards. I love the black background of this DSP from Stampin' Up! called "It's My Party." I used a die to cut out the balloons, a punch for the small balloons, and hand cut banners for the greeting. I had a 3-1/2 inch cube take-out style box left- over from Halloween that was perfect for decorating to match the card! All I have to do is add candy, cookies, or a small gift and I'm done! I love it when things come together like that! Finished card is 4-1/4 x 5-1/2 inches, with borders of colored cardstock and patterned paper each cut 1-4 inch smaller than the previous layer. 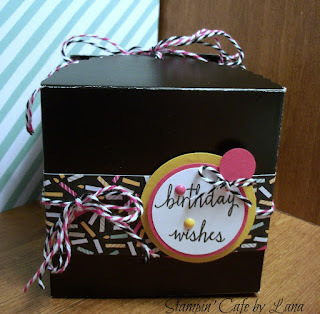 Colors used are basic black, crushed curry and melon mambo from Stampin' Up! 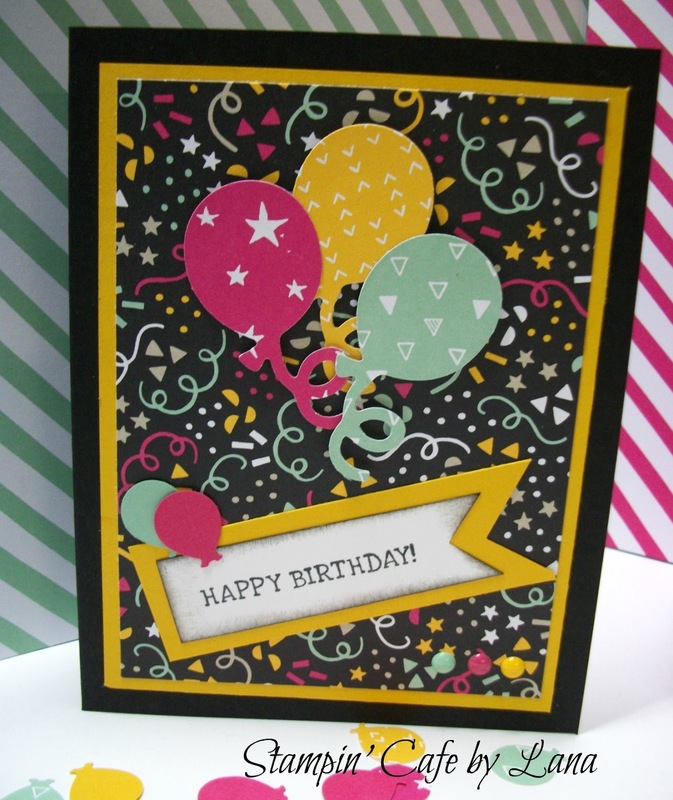 Greetings are from the Remembering Your Birthday and Build a Birthday stamp sets, also from Stampin' Up! Larger balloons were cut with a Cuttlebug die. Smaller balloons were punched from an old punch I've had for years, brand unknown.